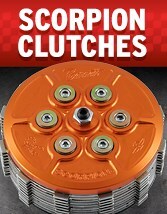 Includes 7 frictions, 6 steels and a set of 5 heavy duty springs. Includes 8 Kevlar friction plates, 7 steel plates and a set of heavy duty springs. Increases clutch capacity.